The wait for Sonic Chronicles: The Dark Brotherhood is almost over, the game is barely a few weeks away from release. Getting the latest issue of Nintendo Power yesterday, I noticed that they’re one of the first to publish a review of the game. Giving the game a 8.0, could this be a sign of much more positive and above average review scores for the very first Sonic role playing game? 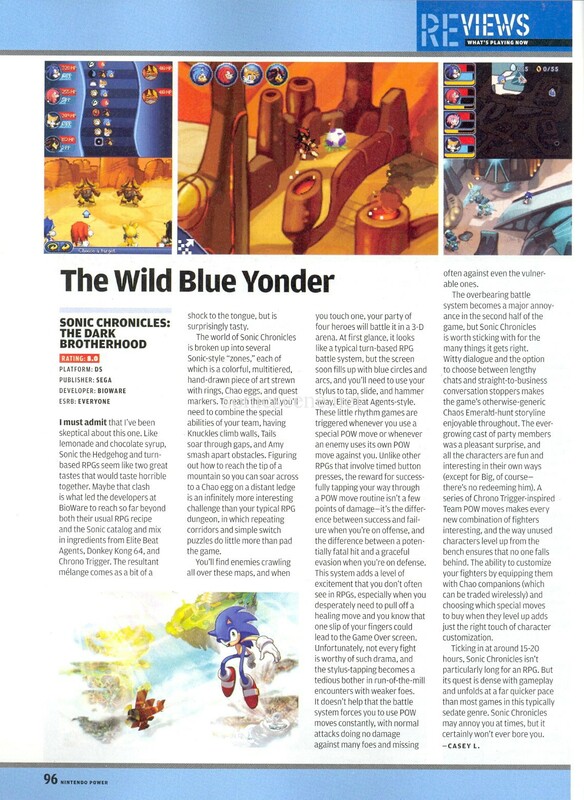 The reviewer starts out at mentioning how they were skeptical at first of a Sonic role playing game, since the thought of Sonic mixed with turn-based gameplay didn’t sound like it would go good together. To Nintendo Power, the game seems to be a mix between Elite Beat Agents, Donkey Kong 64, and Chrono Trigger (not a bad thing). Seems like one of the main complaints is how the game forces you to use POW moves more often then not, since normal attacks will not do damage against many enemies. The storyline did not seem to get too much praise either, being mentioned as a generic Chaos Emerald-hunt quest, but it seems the dialogue options make it much more enjoyable then it could of been. 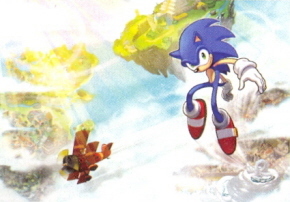 The game is once again mentioned to average out at around 15 to 20 hours of gameplay, which isn’t a very long game from this genre. But it seems it’s very dense with gameplay and has a quicker pace then most role playing games.